The Path to Profit has Shifted. Today it passes through #CSR, the #SDGs and environmental stewardship. It is not a detour. Businesses that understand and embrace this new path gain competitive advantage, markets, relationships and more. Because the path shifted, it’s more important than ever to keep your eyes on the road. Drive recklessly and you will lose value, efficiency and results. Indeed, success on this new path to profit requires a laser-like focus on value and efficiency rather than some willy-nilly “throw money at every hip social and environmental issue-of-the-day” approach. Success in this new paradigm requires that companies understand how to align and integrate social responsibility, environmental stewardship and the Sustainable Development Goals in ways that contribute to profit, business growth and competitive advantage. The operational and financial performance demands on business today are growing at the same time as the demands for improved social impacts and environmental stewardship. There is simply no room for ad-hoc, zero-sum approaches based charity and philanthropy. 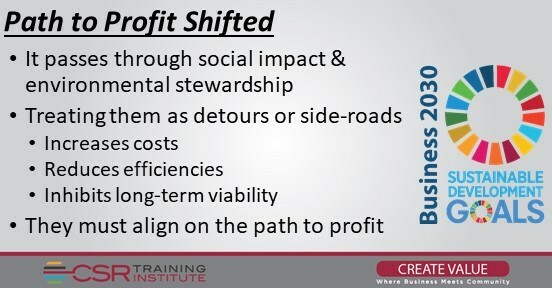 The path may have shifted, but the importance of being strategic and efficient at creating value remains. The difference is that today value must be delivered simultaneously on three dimensions, shareholder, social and environmental. It is more important than ever to be strategic and efficient. Each dimension of value must be probed and understood. Social value and environmental stewardship are not disconnected from shareholder value, not in any business that wants to be successful. It is critical to understand how they connect, where the synergies are and how they can be developed. They cannot be seen as detours or side-roads. That is the only way to be efficient and to meet the demands of Business 2030. What are the social and environmental priorities of our key stakeholders (including internal stakeholders)? What social value can we create and how does that contribute to, or take away from, shareholder value? Where can we improve on our environmental stewardship and natural capital efficiency in ways that will reduce costs, improve competitive advantage and position us for future success? 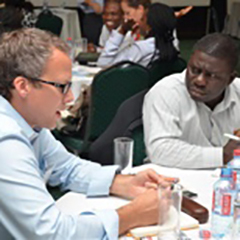 What partnership opportunities can we develop that will extend impact and improve efficiency? What impacts are we having now on the SDGs and where are the opportunities to efficiently do more? What business value (marketing, B2B, employee recruiting and retention, regulatory relationships, stakeholder relationships, etc.) can we gain from improving social and environmental performance? How can we use reporting and communication to enhance that value? When you work through these questions, and others that are specific to your business or project you will start to see a roadmap emerge. A roadmap that will take your business through social value, SDG impact and environmental stewardship, putting it on the road to competitive advantage and sustained profitability. Business isn’t easy today. You cannot afford to sacrifice efficiency on any dimension. Don’t let yourself fall into the trap of throwing financial and other resources at social and environmental issues hoping they will go away just so you can get on with “your real business.” In today’s world social and environmental ARE your real business and are critical touchstones on the path to profitability. Learn them, understand them, and don’t hit the ditch!